This started as a desire to have the most unique coffee Table imaginable. The design also had to have the look and feel of the original cube yet still be fully functional. The size was limited by the width of the doors in my house and the actual weight of the cube. It had to be no larger than 27 inches wide and light enough to handle and move easily. Corner to corner this cube is just under 4 feet yet it weighs less than 30 pounds! STATS: 27 inches cubed VS 2.25 inches cubed. you will need 1728 standard cubes to occupy the space of this one!!! I used 3 sheets of 1/8 inch plywood (4 X 8) I went to a specialty lumber yard for this and got Mahogany for $11 per sheet. the wood joints were from 1/4 inch square dowel. I ended up using around 50 4 foot pieces. I also used several 1/4 X 1.5 X 48 pine slats. I experimented with 3 types of wood glue from Gorilla and LePage. All worked equally well. I toyed with the idea of making a master mold for each of the individual parts then casting them from polyurethane foam but that proved to be rather expensive for the mold making supplies and raw materials. The wood construction is more time consuming but careful work yielded a great working and looking cube in the end. You will also need some way of clamping the wood while it is being glued. I chose some scrap metal and exercise weights. The finished cube is broken down into 27 individual "blocks" . It is easier to describe the build in the terms of blocks but in actuality I made all of the parts in steps. Some of the pictures may appear out of turn but it should all make sense in the end. the clamping was accomplished with painters tape and binder clips. Along with massive free weight. It is typically easier to cut all of the materials all at once then begin the assembly. The plywood was cut into the following rough shapes using a jig to make the cuts repeatable. The pine slats were cut into required sections using a jig as well. The 1/4 inch square pieces were cut into sections long enough to mate the plywood at right angles. It might be handy to have access to some power tools like a belt sander and circular saw. Mark out a square that is 27 inches on all sides. Find and mark the center. Using a precision instrument, Make a circle of 9 inch radius. The side pieces were prepared first using a jig to cut the 9 inch radius section. A small piece of pine slat is cut at 45 degrees on the corners to fit the arc. The pine slat is glued then clamped for drying. Once dry it is formed on a belt sander to conform to the arc of the cutout. Small sections of 1/4 inch square dowel are cut the glued and clamped into place creating an end cap formation. The side panels that are 5.75 inches wide are prepared and then glued into place. all wooden panels are glued into place as shown in the pictures. The result is a wooden "cube with an open section along the arc. Painters tape and binder clips along with weight are used to clamp the pieces together. The corner blocks are made from 2 arc pieces 9 X 9, 1 piece 9 X 8.75, 1 piece 8.75 X 8.75, 2 pieces 8.75 X 5.75. Make a cube from the plywood. Begin by making 2 end caps that are 9 X 9 by gluing 1/4 inch dowel at a distance of 1/8 inch from the edges. Form the cube by combining 2 9X 9 end caps with 2 pieces of 9X 8.75 and finish with 2 pieces of 8.75 X 8.75. the cube should be 9 inches cubed. Begin by positioning a piece of plywood at the edge of a 27 inch square. Mark an arc at 9 inches radius and cut then for the arc. Shape the same arc from pine slat then adhere the arc to the cut shape. On the 9 inch wide piece adhere pine dowel to make a from. Continue gluing until a box is formed. glue the bottom on then lay flat. Close the box with the remaining 8.75 X 8.75 piece. This piece is crucial to the operation of the cube. This piece is glued to the 6 middle single coloured pieces and creates a movable hub for cube operation. The center block is constructed from one 8 7/8 inch piece and 4 pieces 2 15/16 inches. These are glued and held together with metal angle brackets. Find the center of each end of the pieces and drill a 1/4 inch hole about 2 inches deep. This can be done before or after the pieces are glued together. I found that a drill press gave the best and straightest results. Roughly measure the center distance of to center caps place at the edge of a 27 inch square. Find the center measurement from inside flat to inside flat of the blocks then subtract 9 inches from that. My construction needed an 18 inch center block to make the tops of the center caps to be 27 inches. From this I cut 6 pieces of teh cedar at 4.5 inches each. I used a drill press to drill a 1/4 inch hole all the way through. This was followed with a 3/8 hole then a 7/8 hole was drilled to be 3.5 inches deep. I selected 6 5/16 inch 6 inch long lag bolts and 6 3 inch 5/6 diameter compression springs from a local big box store. I also needed 18 5/6 inch narrow washers. Place one end block on a smooth flat surface and position the center piece onto it, then cap it with another end block. It should be no more than 27 inches but ideally be 26.75 inches. All open edges and gaps need to be shaped with wood filler. Allow the filler to dry then sand the shapes smooth. using a jig make all the control surfaces to arc at 9 inch radius. The side block will use a 4 inch piece of slat and the corners will use a 5 inch piece. All arcs are to be braced with a 1.5 inch piece of pine slat. Sand, shape and glue to the blocks as shown. Sanding is best accomplished on a belt sander. The corners require 3 parts and the sides need 2. mark the center on the block and the T section. Mark the blocks as shown with a standoff and precision marking implement. When the parts are dry and smooth, fit them together to check for problem spots. Sand and shape the problems as necessary. After the parts are sanded, prime them with a sand-able primer paint. Let this dry then fill any spots with a Spakling compound. The smoother the surface the better the finish. Only the faces of the cubes need be perfect. The rest will be hidden from view. I used Dry-Dex to fill the faces. Spread it with a paper towel and wipe off the excess. Sand with at min 300 grit for a smooth finish. Mask the cubes using 1 inch tape. Make the tape cover at least 1/2 of its width on the face. Mask the corners of the tape sections to make a bevel. Paint with the desired colour as per your cube. The colours shown are for the standard cube. Mask for over-spray as shown. Make all cubes as needed by marking off colour sections on a standard Rubik''s cube. Remove the mask from the cubes when it is dry. Assemble the cube as a test run. Glue the center block into place(Not Shown) then assemble the cube as shown. The regular size cube is shown for reference. The core block is fit together using springs for tension on the outer blocks. The springs need enough tension to secure the blocks but not so much that is halts overall cube operation. Use a standard cube to position the large center blocks and glue/ screw them into place. The ends of the cedar center block were prone to splitting so I used some wood glue and wrapped then ends tightly with cloth hockey tape. No more splits. 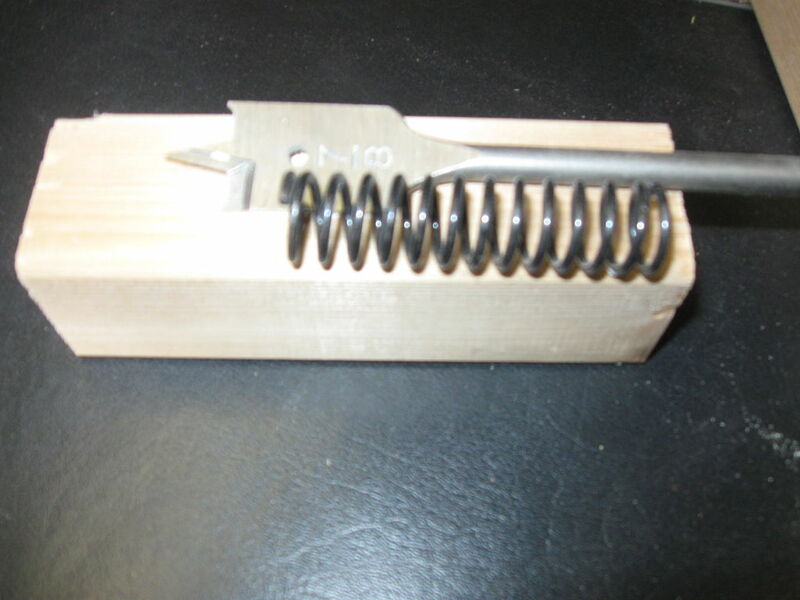 The spring is secured with a 5/16 by 6 inch lag bolt. The spring is 3 inches long. Make the center cross block as shown using a standard cube for reference. Begin by positioning the core assembly on a flat surface. Populate the lower blocks by beginning with the middle blocks first then fitting the corners of the corresponding colours. Next fill the center row then populate the to leaving a middle block free. Fit the middle block last by lifting up on the center block then wedging the block into place. At just under 30 pounds this cube is entirely playable. Fully functional yet it acts as an innocuous coffee table. each block is 9 inches cubed. The entire structure is 27 inches cubed. The paint was not dry on this one as the pictures were being taken. I m not sure why but I love you... And seeing that it was posted 'unsuccessful' is so ironic- I'm pretty sure you don't see it that way...cheers. You have qualities I wish I had, but can admire from afar.. I kknow this is old but does anyone know where I can purchase one? I run a special needs summer camp and the kids would love this! I'm curious if you got in cintack about purchasing the life size rubik's cube. I will be producing these shortly. Plus I am working on a campaign that could provide you with one of the first. Are you trying to go for the princes bride's refrence? Nice catch and you can usually spot a movie reference in most of my work. "The center block is constructed from 1 8.78 inch piece and 4 pieces 2 15/16 inches. These are glues and held together with metal angle brackets"
I'm looking at photo that you have where they are posted over a ruler, and it looks like the 4 pieces are closer to 4"
Very cool! I was obsessed with my Rubik's cube as a teen. Just out of curiosity do you have an approximate cost of the whole project? Total cost was about $80. Prices vary depending on local sales. The majority of the cost was for the paint, spray for this one cost about $45. This is incredible! Would you be prepared to make one for sale?